The magical March household, with its timeless, coming-of-age themes of sisterhood, love, ambition, growing, and the ups and downs that come with it all… When I think of Louisa May Alcott’s Little Women, my childhood – particularly my early teen years – come flooding back. Just thinking about the story makes me smile. You can only imagine my excitement when I heard that there was a new adaptation in the works to mark the 150th anniversary of the book’s publication. Another opportunity to revisit it! The story has been beautifully reimagined with a fresh, modern twist. “New generation, same sisters.” Having received a Utah state film incentive in 2017, the majority of the production was filmed in Salt Lake County, with the iconic March house set in suburban Holladay. I had the pleasure of speaking to director and co-writer Clare Niederpruem (CN) and co-writer Kristi Shimek (KS) about the film, their careers and more. 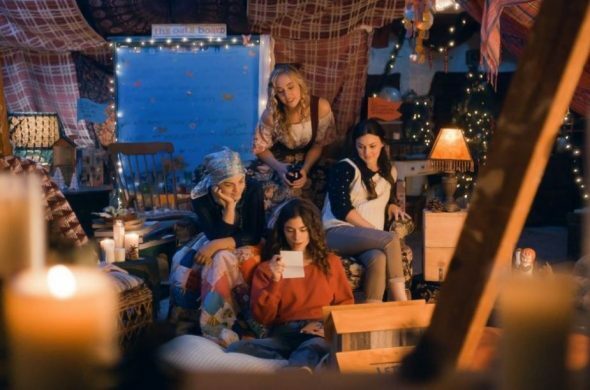 Clare makes her directorial debut with Little Women and most recently directed an episode of the new CW show, The Outpost, also filmed in Utah. She has previously taken roles as assistant director and production designer and acted in various features including the made-in-Utah Once I was a Beehive. Kristi has worked in television and film for the past decade as a writer and editor. She is a co-founder of the independent production company, Escapology, and has served as a producer on multiple award-winning feature films, including Looking Glass, also filmed in Utah. Check out the trailer for Little Women if you haven’t already, and be sure to go and see the film once it hits theaters on Friday, September 28. Tell us about the inspiration for the film and what drove you to tell this story. CN Little Women has always been my favorite story. I read the book and watched the films during my childhood, and when I revisited the book in my adulthood I found it to be even more inspirational and impactful. It also felt very relevant to my life and relatable to the relationships with other women. So, I went to Kristi (who is also a huge fan of the book) and together we explored what the March family would look like in 2018. KS I grew up in a home that in many ways reflected the March family of Little Women. My siblings and I would create and perform plays for my parents, we played outside, we read voraciously, and we always had a lot of music, art, and film in the home. Little Women was treated as a sacred classic, and at a young age my sisters and I were each given our own copy to enjoy, which I did by reading it every year at Christmas time for many years. So, when Clare came to me with the idea of adapting Little Women into a screenplay, I jumped at the chance. I don’t think she could have found a more avid fan of Little Women as a writing partner. We felt strongly that Little Women had universal themes that could translate into the modern era, and so we forged ahead with the hope that we could create something that would speak to a modern audience. More than anything, it was really important to us to tell a story of women empowering each other by supporting their unique dreams and aspirations, and Little Women is one of the greatest works of literature to portray that very idea. Why do you think the story is still relevant and what makes it resonate with audiences 150 years on? CN Little Women is a love story between four sisters. It’s about the different stages in our life where we dream, hope, fail, learn and continue on – all human emotions that we still deal with today. Louisa May Alcott explored different female voices through the sisters, making each one of them dynamic and different, and so that everyone can relate to someone in this story. Also, the relationships between the women are complicated and lovely; I found them to be incredibly relevant to the relationships I have with the women in my life. The story also questions how we support each other even when we want different lives, have different ideals and take different paths, and how to love each other and lift one another up through those differences. All of these elements translated smoothly into a modern telling. KS I truly believe that Louisa May Alcott was a visionary for her time, and could see a future where women were empowered and bold and an equal part of society. She was passionate about these ideas, and though we have taken many steps in that direction, there are things that we are still dealing with and working on as a society to this day. I think that is why it translates so well for the modern era. Through the four March sisters, she was able to portray the lives of four very different women with unique passions and goals, who find that their love and support of each other is more important than anything else. That theme is more relevant than ever now. We all need to support each other’s dreams to create a better and brighter future for us all. What drew you to Utah as a filming location? KS Utah has very frequently been our home for filming, and Little Women was no exception when it came to where we wanted to shoot it. Utah is really unique in that it has many diverse landscapes, and we felt that we could get that great old-fashioned American feel out of the physical locations, which was important for the look of the film. I’ve also worked with the Utah Film Commission for years, and they have always been my greatest resource when it comes to finding anything I need, from locations to crew members. I always choose to shoot in Utah if I can, because I know that I will have support for Utah filmmakers in every regard. CN First off, the amazing crews you can find in Utah. There is so much artist talent mixed with hard-working attitudes. From hair and makeup to the gaffer to the PAs – the caliber of talent is incredible. Utah embraces filming. The Film Commission is always available to help, they understand film making and are always trying to make the filmmaker’s life easier. On this particular movie, they helped us find the perfect ‘March Home’, which was no easy task, but ended up being the perfect fit. Last, but not least, Utah has a way of making everyone feel at home. Whoever we bring from out of town is destined to have a love affair with Utah. Can you tell us about your experience working in Utah? How much of a Utah presence did you feel on set (in terms of locations, cast and crew)? CN See above – but to add to that, we also had a lot of local cast from Utah. We found our ‘Younger Amy’ who is a Utah native and she shines in the film. As well as Barta Heiner and Michael Flynn, two of Utah’s greatest and most experienced actors. KS Utah was a huge part of the filming experience of Little Women. Almost all of our locations were Utah based and the majority of our cast and crew were also Utah based. Even though we were going for the look of New England, I would say the presence of Utah is very strong in Little Women in that it gave us the ability to achieve what we were hoping and more with the film. The film had a strong female presence both in front of and behind the camera (inc. writers, director, producers, cinematographer), which feels right to tell this story. Did you consciously seek out women to work on the film? KS I would say that we did consciously seek out women to work on the film in some ways. 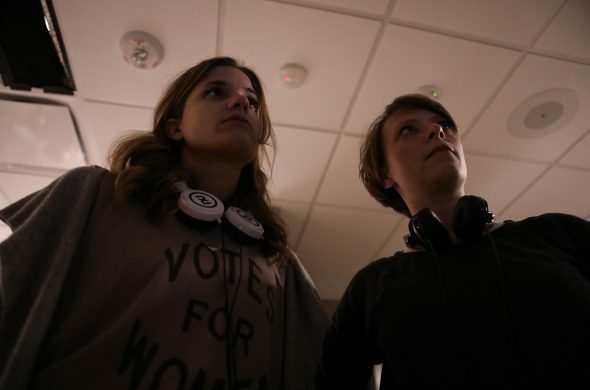 Clare and I have both previously worked with a lot of the female filmmakers that joined us, including Lauren Spalding our Production Designer and Emily Jacobson our Wardrobe Designer who were both so influential to the physical look of the film. We were especially hoping to find a female Director of Photography, and we found an absolute gem in Anka Malatynska, who delivered on every level with her unique style and talent. That being said, we had some amazing men on the team who were our absolute support in making this happen and who were also extremely supportive of Clare’s vision and of the feminine touch to this project. We really couldn’t have done it without each and every player that came on board. CN Because we were telling a female-driven story, we knew having a strong female crew behind the camera would be beneficial because they responded to the material so strongly. When your crew loves the story you are telling, it makes everything more meaningful and you can feel that on camera. Everyone cared about this film. Even though most people were working for under their pay grade and for longer hours than normal, everyone was passionate about the project. This created a collaborative, positive energy on set that made it a wonderful film to work on. Did you always want to pursue a career in the film industry, and how did you start out? CN I always knew I would be doing some sort of storytelling. I started off as an actress, and have always been a writer, so that was my first introduction into filmmaking. The first set I was on was Orcs (a Utah film) and I fell in love with the comradery of this creative outlet. I worked as a PA, an assistant, a costume designer, a script supervisor – pretty much every department possible and, in this way, I learned by experience how the filmmaking process works. Utah really embraces young, driven minds who want to learn and I was lucky enough to have opportunities to be on set and gain that experience. KS I grew up watching, enjoying, and loving movies – from classic to modern films, but I found an interest in making a career out of filmmaking in high school. I had a media teacher who was connected to the film industry and thought I would be a good fit, so he set me up as a PA on a film set the summer before I went to university. It was a fantastic experience and I fell in love with the idea of making a career out of it and have been working at it ever since. Clare, how did you experience being behind the camera, with this being your directorial debut? CN It was exciting, terrifying and so rewarding. Directing is taking a piece of everyone else’s art and creating one big piece of art. I love the collaboration of the process and seeing the end result is incredibly gratifying. I have a lot to learn since this is my first film, but it was my favorite role I have ever played. What advice would you give to a local who is trying to get into the industry? KS My advice to anyone trying to get into the industry would be to try to get on as many productions as possible and, when you land a job, work hard and show the team what you’re made of. All experience is valuable, and every production will give you something to learn and grow from. Filmmaking is a lot of hard work, but it can be such a rewarding experience if you are open to what the production has to offer by way of learning. CN Get on set as much as you can. It is the best way to learn. Even if you have to volunteer at first, there is no learning experience like being right there and seeing the process unfold. There are many productions going on in Utah at all times, and most of the time if you are polite and driven, people will enjoy having new faces on set.